Automatically switches the altimeter between AGL and ASL modes as appropriate for the ship's current situation. Configurable settings let you adjust how it behaves. You can still manually switch as you like-- the mod won't "arm-wrestle" you. Unzip the contents of "GameData" to your GameData folder, same as with most mods. 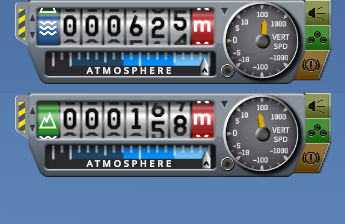 KSP 1.7 introduces a new feature that allows toggling the altimeter between "ASL" mode (height above sea level, i.e. 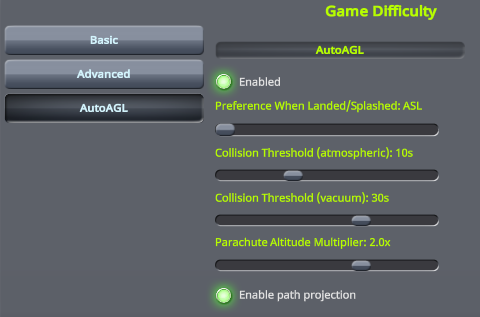 what it's always been since the dawn of KSP) and "AGL" mode (height above ground level-- this is the new KSP 1.7 feature). All you need to do to toggle between the two is to click on the little blue-or-green button on the left end of the altimeter. It's a great feature, very handy, and one that KSP players have wanted for a long time. I'm really happy about it... but I'm also very lazy. I'd like it to just automatically set to ASL or AGL based on what's "right" for the current situation, so that I don't have to mess with it. On the other hand... I still want to be able to switch it manually whenever I want, since "special circumstances" can always come up where I need to decide on my own what to set it to. Well, this mod takes care of all that. It just automatically sets the altimeter to the "right" mode (more on what this means, below) based on the ship's current situation, but the player can still manually toggle as desired and the mod will respect that. What do you mean, the "right" mode? It sets to ASL when you're landed or splashed. It sets to AGL when you're "low", i.e. "close" to the ground (more below on what this means). It sets to ASL when you're higher up. At Kerbin sea-level pressure or higher: If your free-fall time from the ship's current position to the surface is under 10 seconds. In a vacuum: If your free-fall time from the ship's current position to the surface is under 30 seconds. If you have any activated parachutes: If your height above the surface is less than 2x the parachute's "open" altitude. The practical upshot of this is that on Kerbin, the altitude boundary between ASL and AGL modes will be a bit under 500 meters if you're close to sea level (e.g. at KSC), somewhat higher if you're over higher-altitude terrain. If you're falling rapidly, it'll be higher still. If you have any active parachutes, it'll be 2000 meters (i.e. twice the parachute's activation altitude, assuming you've got it set to the default 1000m). What happens if I manually toggle the altimeter? It "just works". It switches to the mode you choose, and stays that way without automatically switching back. However, it'll later revert to automatic mode when circumstances are "appropriate". Nitty-gritty details in KSP forum thread if you're curious, but the practical upshot is that it "just works" and does pretty much what you'd want it to. The default behavior is tweaked to be the way that I, personally, like it, since it's my mod. Enabled: Checked by default. If you uncheck it, it completely disables the mod. A handy way to temporarily shut it up without needing to completely uninstall the mod. Preference When Landed/Splashed: Which mode do you want the altimeter to be in while you're landed or splashed? Choices are "ASL" and "AGL". Defaults to "ASL". Collision Threshold (atmospheric): Defaults to 10 seconds. When local pressure is Kerbin sea-level atmospheric or higher, it automatically switches to AGL when you're within this many free-fall seconds of hitting terrain. Collision Threshold (vacuum): Defaults to 30 seconds. Like the setting above, but for when you're in a vacuum. Parachute Altitude Multiplier: Defaults to 2.0x. If your vessel has any armed parachutes, will automatically switch to AGL mode when your height above the surface is less than this number, times the highest activation altitude of any armed parachutes.